Elegant, sweet, pretty, sublime tone, rare collector’s item, very few made “1946 Knabe 4’11” Symetrigrand”. New hammers, new dampers, new back checks, new knuckles, beautiful original ivories, new semi-gloss mahogany finish, action regulated, all work done around 12 years ago. Rarely played since. Excellent condition inside and out. Free Long Island/NYC delivery. All else continental USA delivery only $475. One year warranty. Questions? Call Sonny Direct at 631 475-8046. Knabe Baby Grand Ebony 5’1″ made in 1971, one owner, well maintained, lightly played, excellent inside and out, either new hammers or just rarely played as hammers barely have a groove in them. Rich classic Knabe tone and responsive action. One year warranty. Free Long Island/NYC delivery. All else continental USA only $475. Questions? Call Sonny direct 631 475-8046. Art Case Knabe Baby Grand Piano, walnut with french cabriolet legs, french provincial style, one owner, rarely played, 1973. Great Knabe tone and action response. Free Long Island/NYC delivery! All else continental USA only $475 for delivery and set up. One year warranty. Questions call Sonny Direct 631 475-8046. Click Here To See The White Gloss Baby Grand Video Tour! 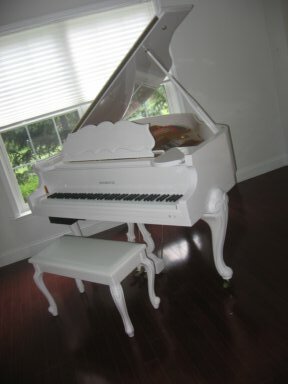 Gorgeous Gloss White Samick Player Baby Grand Piano with Queen Anne legs, only 5 years old, like new. PianoDisc Player System installed, comes with disks. Originally $15,000. Sacrifice $9000. Beautiful furniture piece, great tone and action. Bring it home in time for the holidays. Questions? Call Sonny Direct at 631 475-8046.